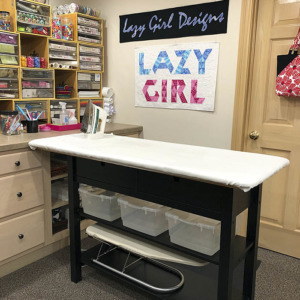 Lazies, I’ve gotta tell you – I had a notion panic in my sewing room this week. I was working on a Miranda Day Bag and needed to cut the corner notches that form the bottom of the bag and I couldn’t find the ruler I’ve come to rely on just for cutting corners. 3 1/2″ square ruler from Creative Grids. After moving heaps of stuff around in a Lazy search for this prized cutie, I remembered that the ruler was still on my desk in the office because I needed it there for something last week. And like a Lazy Girl, I left it there. This beloved and elusive notion is a simple 3 1/2″ square ruler. No biggie, literally. But it’s perfect for something I do a lot of – marking and cutting corner notches, or trimming small pieces. There are lots of brands available, but I use item #CGR3 from Creative Grids and it retails for a bit over $7. I use this ruler all the time to make the corner cut out in the picture below. This is a sample of a 3″ corner cut out on one of my projects. At 3 1/2″ this small ruler is large enough to hold onto, yet small enough to easily maneuver around a project. Many of my bag projects have large pieces. It is a easy for me to position a small ruler on the corner of a large project piece for marking or cutting. I like this small square ruler because I can measure two directions at once. Just like using a ruler to square-up a block, I can measure down and over at the same time, mark both edges, then cut. Since I’m cutting into a project piece (rather than trimming away an outer edge) I usually cut most of the length with a rotary cutter, then scissor cut to the inside corner so as to not over cut. Acrylic rulers can slide around a bit while working on fabrics. 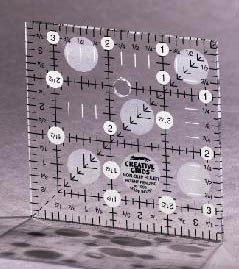 One of the features I like about Creative Grids rulers is the embedded gripping surface on the underside of the ruler. 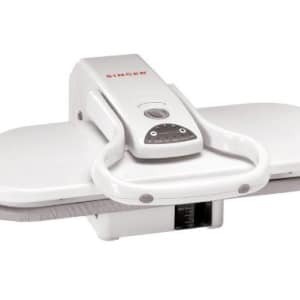 The grippy areas help hold things in place while working. I think any square-up ruler about 6 1/2″ or smaller would be just as easy to use as this 3 1/2″ ruler. A ruler designed for squaring a quilt block has several features. The numbering starts at zero in the upper right corner of the ruler in the first picture above. For a 3″ square cut-out, place the zero corner of the ruler on the project. 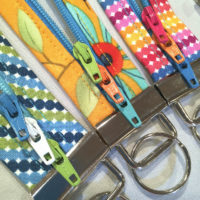 Then slide it into place matching the 3″ measurements on both sides of the ruler to the edges of the fabric. Mark and cut. Easy as pie. For me – apparently lots. I don’t know how I became such a ruler junkie. For years I used a 6″ x 24″ ruler for all my cutting needs. Now, I can’t live without a family of different sizes. I don’t know when that happened. My first thought when I saw this ruler was – oh that’s cute, but what would I need a small ruler for? Then, like the notions nut that I am, I bought it anyway. I’m so glad I gave this ruler a try. There are a number of ruler manufacturers who offer great products in a variety of sizes and shapes. 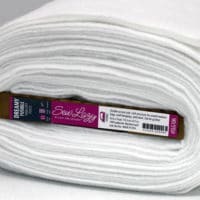 Find a brand you like and trust, then build your ruler stash as the opportunity and your varied cutting needs present themselves. I (heart) Creative Grids rulers! I hope they never stop making them. 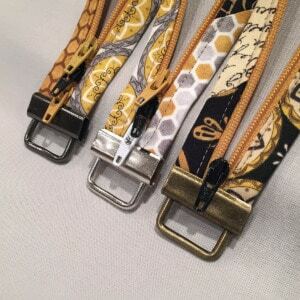 I remember being in a class when these first came out and we were all ga-ga over this Turnaround ruler we tried. I’ve not bought another brand since. Love the little 3-1/2″ ruller. Just a small caution that the user be mindful to start measuring from the side of the ruler that starts with zero – and not the side that starts with the 1/2″ mark. I have seen beginner quilters who have not fully realized that one side of the ruler starts with a 1/2″ mark and miscut their pieces. It is an easy mistake for any quilter to make, especially when we are in a hurry to finish our project and admire our work. Maybe a mark or a piece of “Cutting Edge” on the line between 3″ and 3-1/2″ lines would be a good indication to be mindful of the orientation of the ruler before measuring and cutting! I have the 4 1/2 creative grid ruler and love it! I just recently bought it and already I don’t know how I ever lived without it! I’ve been using both my 3.5 and 6.5 rulers for so many tasks I would never have thot of when I purchased them. Handy, handy, handy. Hi I’m Penny an I am a ruler addict “Hi Penny”, I must confess I have so many rulers that I can’t remember when I bought them! Including a little 2 inch square. I really think they have made our lives easier. Thanks for sharing with us Joan. I too have more rulers than a girl could possibly need…including duplicates of my favorites that I often misplace…the 3-1/2 and 6-1/2. Most are duplicated just because I’m switching over from those awful yellow rulers that claim they grip to the Creative Grids that actually do…LOVE THEM!! Yes I too have a bunch of rulers…some duplicate sizes by different companies! Most of mine are Omnigrid. 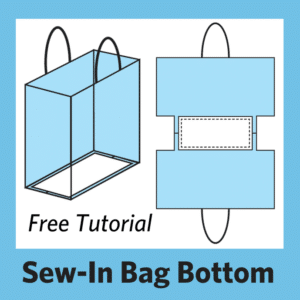 The last one I bought was the 30″ square (got mine from Joann’s with a 40% coupon) so I could use it to cut some of the pieces accurately for different Lazy bags. I realize it probably was unnecessary, but I love looking at that HUGE square! I also have a 2 1/2″, 4″, 6″, 6 1/2″, 12″, and 15″ squares (AAA!) and a 6″ by 24″ rectangle (which I use most often). 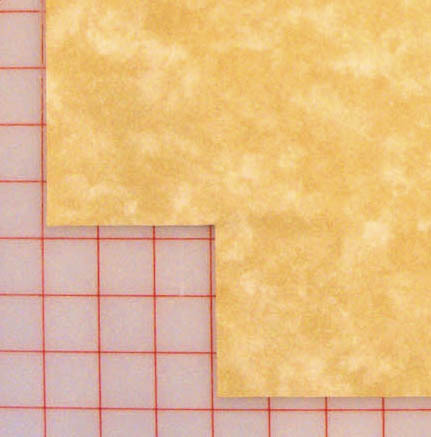 I rarely use the smaller squares but I have used the 6″ square to do what Joan does for the corner notches. Usually I mark them with a pen then cut with scissors because Im afraid of over cutting with the rotary cutter. As far a slipping goes, I use the invisigrip (which is like vinyl that you cut and it sticks to the back of the ruler). It seems to do a good job. I love my rulers too! I have so many now and I use them all. I had to get one of those wood ruler racks to keep them all at my fingertips. I, too, use all kinds and sizes of rulers. I have from 2″ square up to the big 30″ one. 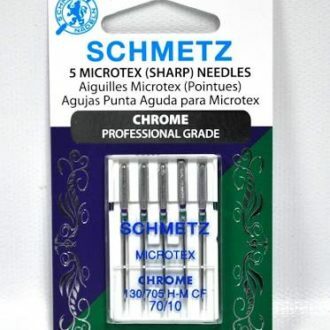 I have gotten a few with the extra 1/2″ as well as the ones with just even amounts. I am very careful which one I pick up (lol) I did cut a strip wrong once with an 8.5×24″ ruler. 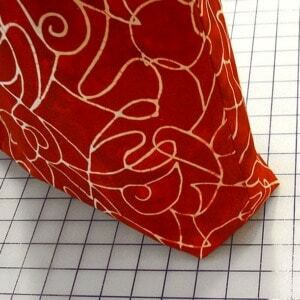 It is great for squaring quilt corners. You cannot have too many rulers. The only one I haven’t used a lot is one that has slots in it for ‘place holders’. Forget what that one is called. It seems a bit flimsy because it seems thinner and floppier because of all the slots in it. I need to learn to use it too. I also like the big square ones with lots of slots for cutting several strips at a time. Such a time saver. I have the 1/2″ and 1/4″ slot ones. Tip: when you cut stirps or other consecutive cuts. Do not move the cut strip entirely off the cutting area. Let the ruler rest on it and it is easier and more accurate to line up for the next cut. sounds like Joan needs to get another one!! 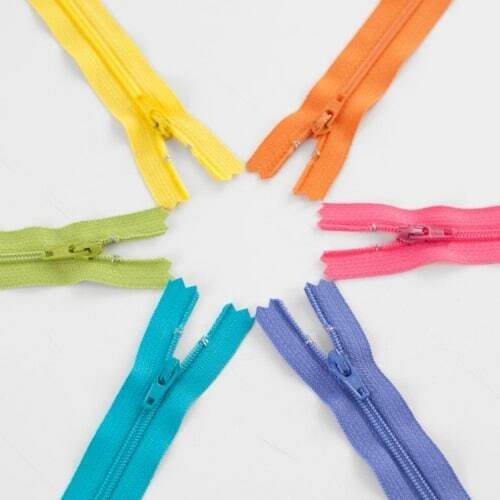 I keep mine by the sewing machine for any little thing that comes along while piecing & quilting. VERY handy!! You just reminded me that I used to have a 3 1/2″ ruler. Have no idea where it has disappeared to. I’m also a ruler ‘junkie” with lots of different sizes. 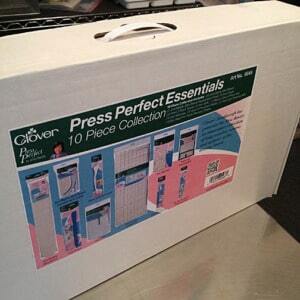 I used my 6″ x 24″ ruler for years, but when Omnigrid came out with their 8 1/2″ x 24″ ruler I bought it & like it even better than my old 6″ x 24″ ruler. 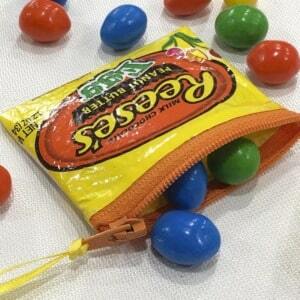 It’s great for Lazy Bags! I buy Omnigrid exclusively because I know they will be accurate with each other. Where do I purchase the Creative Grids products? Does anyone know a website?